We are in COSTA RICA!!!! It was a long day of traveling but Makenzie did GREAT!!! SHe is such a little trooper!!! We were met right off the plane by a gentleman who helped us get our bags and make it through customs! Well the other way around but what ever! Right as we got to the baggage claim the people from ICM were there to great us in English!!! AHHHHH!!! They helped us to the van and with in 15 min we were at the hotel and breathing much easier!!! The hotel is BEAUTIFUL!!! It is CLEAN and the people are great!!! We have a full kitchen with a microwave and 2 bedrooms!! We have already met several people and their families that are here for treatment! Every one is so kind!!! I unpacked, made formula... with my $4 bottle of water... the money exchange thing is a bit rough!!! LOL!! Then Makenzie puked all over her daddies white shirt! I knew that was going to happen! It is hard on her to travel! She is soundly sleeping right now!!! Pray for a good nights sleep and no more puke!!! 12pm IV placement at hospital under General sedation. *Everyone we have talked to has said the hospital is great! They will be drawing blood to test as well and seperating Makenzie's serum to mix with the donor cells. Please hit your knees at these time for Makenzie! Only God can Finish what man has started!!! Thank you again for all of your thoughts and prayers!!! With out ALL of you we would not be here today!!! THANK YOU from the bottom of my heart!! Today was another wonderful day!!! We did a lot of resting and socializing! I do however miss my boys! It is hard this time because I don't really have the option to pick up the phone and call!! We got up and had breakfast here. They serve it free every morning. They had some "normal" stuff and also some quite interesting but good food. There is no bath tub so I carefully showered Makenzie and we were ready for the day! The people here are amazing!!! We sat by the pool and chatted for a good long while thing morning! Then we headed out down the street for some Chineese food as the resteraunt at the hotel is closed on Sunday. It was such a fun experience! There are some english speaking nationals here but not many! The money conversion is a bit crazy but they will change it right here at the hotel so it has worked out ok. When we got back Jodie and her gang where just getting in from the airport! WOW!!! Lets just say it is going to be very hard to say goodbye! We just got back from dinner and Makenzie is sleeping soundly! She has been so good today!!! Thank you for all of your prayers! She didn't have any stomach problems today and I even got in some extra as she will not be able to eat after 4:30am and will only be getting clear fluid tomorrow as she vomited after General sedation 3 weeks ago. Tomorrow we go in to ICM to meet the doctors and ask any questions we still may have. I must say I don't have many! Then at 12:30pm we will be going to the hospital to have the IV placed! Everyone has told me how wonderful it is and amazingly I am ok with it..... for the moment!! Please pray for Makenzie tomorrow at 12:30pm Mountian time. I have felt all of your prayers and they mean so much!!! Pray Pray Pray Pray Pray!!! Believe.... Prayer Works!!! I will post about our day a bit later. Makenzie had the IV put in and it went well. They put it in her foot and she is not happy about it!! I just spoke with the doctor to make sure Tylenol wouldn't mess up the cells and he said no so I gave her some! Please pray that she can find sleep!!! That being said I need to take care of hopfully getting her off to dream land. I hope to give details after that happens! Pray for sleep! So to my boys...before you head to bed.... your sister is fine!! She is smiling and giggling in the other room! I love you and miss you and hope you are having fun! I have given up on trying to go back to sleep so I thought what better to do then blog!! LOL!! I posted some pictures in the post below so check them out!!! We got up and I gave Makenzie the last bath/shower she will get until friday night! That should be fun to do dirty hair!! OOh my! Then we got so breakfast and sat for a bit and chatted by the pool! Our appointment was at 9. The clinic is about 1.5 blocks away from the hotel so we met Jodi and Charlie out front and walked! San Jose is a bit crazy! Oh the simple things we take for granted!! It has been beautiful and even though it is rainy season here we have only seen a few drops of rain! Our first appointment went VERY well! We filled out some paperwork and then we got to do meet with one of the doctors! Right from first glance I felt great about ICM! The doctor sat and talked with me for about 20 min and snswered ALL of my questions! He even answered a few I didn't know I had!! I asked him about all of the different protocol ideas there are out there about the best way to give Stem Cells and the answer to each made a ton of since! WOW!! I am still amazed! We came home and relaxed for about an hour and then got into ICM's van and headed to CIMA Hospital. It was beautiful! They checked us in and a nurse came and got Makenzie and I first. They would only allow one other person so I think Chris was a bit bummed! At this point I started to feel a bit scared! There waas only one nurse where we were that knew english! They took all of her measurements and when the doctor from ICM got there they took her back..... with out me!!! At this point I thought I was going to loose it!!! I felt all of the prayers and knew that God was there and that he has brought us here so all would be fine! It was! They tried to place the IV in her arms but her veins were to small so they put it in her foot. They also took a few vials of blood to test and then they will mix they cells with her own serum. Makenzie was SCREAMING!!! I picked her up and she stopped for a brief second and then started in again! She was blotchy faced, coughing, and her lip was even quivering! I have never seen that before! I thought it was from the drugs as I have heard that can be a reaction kids have sometimes but she just wouldn't stop! Then she started pulling up on her leg and I realized that it much be from pain! I asked the one nurse that spoke english for some meds and they brought her some tylenol! When we left she was still scream but the second we stepped out the door and into the lobby guess what happened..... yep... you guessed it... she stopped!!! Smart Girl she is!! LOL! As soon as Lil Charlie was out and ready to go we hopped back in the van and headed back! A big sigh of relief!! The hard part is no OVER!!! Makenzie started complaining again about her foot at about 6pm and would not go to sleep!! She just cried! I called the doctor on his cell phone and he PICKED UP!! AMAZING!! He said that giving her pain meds was totaly fin and would not affect anything! In fact he offered to bring us some!!! WOW!!!!! I had some tylenol so I gave her some and she drifted of to sleep about 9pm. I fell aleep with her and woke up to her wimicing about 12am. I gave her more meds and she and I fell back to sleep. I woke up at 3:30 am after sleeping for 7 hours ready to go!!! AHHHHH! I think I will be taking a nap this afternoon!!! Makenzie gets her first Stem Cell injection today at 10:30am! 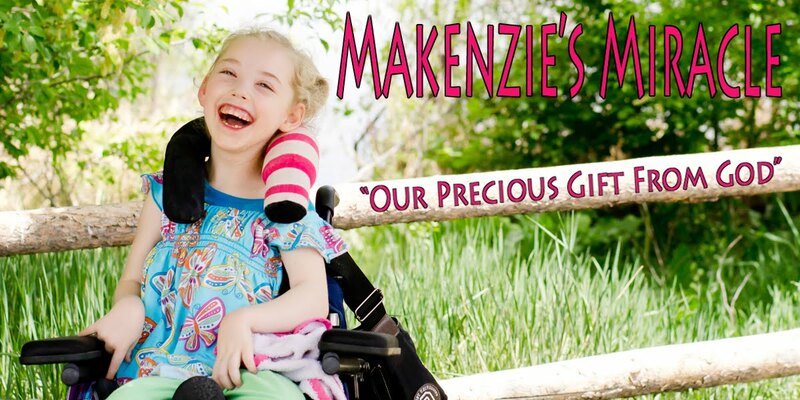 Please pray that God would send the cells to the areas that Makenzie needs them the most!!!! Pray pray pray pray!!! Charlie... Makenzize's little friend will also be recieving Stem Cells then as well so send up prayers for him too!! God hears!!! Please give him something to listen to!!! Thank you for EVERYTHING!!!! Keep checking the side bar for short updates throughout the day!!! It's gonna be a good one I just know it!!! Today we did a whole lot of NOTHING! We got up and had breakfast. Kenzie and I sat by the pool for a little while and chatted. The weather here is GREAT! There are times of beautiful sun and it is just the perfect temperature! The day we got here everyone said that like clockwork at 1pm it would down pour. Not since we have been here!!! This morning it was raining a bit when we walked to ICM. We walked really fast think that it was going to start dumping rain. It didn't! The clinic is only like a block away. They have drivers that come to pick you up in a van but it seems so much easier just to walk! While we were waiting at ICM I was talking to one of the ladies that works there. I asked what a neighbor hood in Costa Rica looked like. She looked back at me a said "this is it"! Wow, I couldn't even imagine! She said this area was like a buisness neighborhood and that others were just like it more or less with narrower streets! Hard to imagine! There seems to be very little traffic law and pedistrians do not have the right of way!!! LOL! It is SOOO different! I also found out that Health Care in Costa Rica is free!! I guess when you are sick it can take up to 3 weeks to be seen or you have to stand in line ALL day at the clinc in hopes to be seen! I am not feeling the socialized medicine thing! The hospital (CIMA) that we went to is private and was beautiful and is not free. Makenzie did great with her injection today. She still cried but we got it done and it seemed a bit easier! She was MUCH looser today. In fact her hands were wide open most of it! She had the lady at the desk a high five ( Makenzie style) and she had a great time playing with Charlie and his daddy! The two of them are so much alike! Instead of going out to dinner we ended up ordering pizza. It worked out great and Makenzie got to bed on time for the first time since we have been here! She was so tired!! Makenzies OT will be flying into Costa Rica tonight. We are so blessed to have such a great group of therapists!!! I can't wait for her to get here!! I am hoping that wwe can get a tour of ICM's lab tomorrow so we can see were the cells are procesed! That will be VERY interesting!! Thank you again for all of your thoughts and prayers!! Round number 3 is at 10:30 again! Please pray!!! Makenzie has been getting up at about 6am! We got up and I gave Makenzie a sponge bath and did her hair! Breakfast is ok and we sat by the pool and talked with all of the wonderful people also here with ICM. Makenzie's OT flew in last night and met us at the clinic this morning to see what this is all about and hang out! Makenzie did great! She cried... yes... but we got it done! We left there and came back to the hotel and sat for a bit. We then walked up to the subway and all managed to order sandwiches for lunch. Language barriers are so much fun!!! It is quite the experiance! As we pulled up to the museum our driver told us that the building used to be a prison! The museum was nicer then I thought it would be. A lot of the exsibits were broken and most of the toys the kids thought were cool I have in my living room! It was surly eye opening! They had coffee bushes and bannanas trees and showed how they processed them. They had a real helicopter and a train engine! There was a simulated earthquake that Makenzie loved and a floor piano that lit up when you stepped on it! We stad for about an hour and our driver was outside waiting for us when we were done. Then it was rush hour and the roads where even more crazy! We got home and got Makenzie ready for bed! She is doing so well!!! Her OT was so suprized at how loose she was!!! She is sleeping now! One more injection and we are done and the IV comes out!! She will be soooo happy! We leave on Saturday mornig!! I am ready to get back to life!!!! Remind me in a week that I said that!!! LOL!!! Please pray for us tomorrow! Also start praying for safe travels home!!! We had an AMAZING day! I am so sorry but, I am going to leave you hanging as I had to pack and say many goodbyes! This place was truly incredible!! We met so many wonderful people and God's presence radiates! I posted pictures on dropshots (picture tab above) if you would like a sneak peek! Please pray for safe and easy travel! We leave for the airport at 6:30am! Pray for the cells to continue to grow into what Makenzie needs to heal! Thank you every one!! I will post tomorrow night and on twitter as the day unfolds!! Sorry it has taken so long for me to update! We spent the last day in Costa Rica doing out last treatment and playing tourist! Makenzie went in again at 10:30 for her last injection and to have the IV removed. She was pissed!!! However we managed ALL of the procedure in Costa Rica with out any vomit which is amazing! We left there and got in a van and went out for lunch and to a butterfly garden about 20 min away from our hotel. It was very pretty! Makenzie enjoyed looking at all of the butterflies and green trees and flowers! The real entertainment to all of these outings was the drive there and back! It is amazing how these people live and yet they are so happy and kind! We stopped by the hotel for a few minutes and then we left to go back to ICM for a tour of their lab! It was AMAZING!!!! They showed us all of the machine used and explained the process of screening, reproducing,and harvesting the cells. It was so clean and all of the people there were using universal precautions. WOW!!! We got to see the cells after they pulled them out of one of the machines. They were in bottles with a suspension substance. On the bottom was a little clump of cells! 300,000,000 to be exact! I was so excited to see this process in action. Makenzie's OT was also there and we sat for a bit and had question and answer time which was also great!!! I wish I could put it all in writing and maybe one of these days I will but it is sooooo much information! All I have to say is that I feel GREAT about the decision we made to go to ICM! We then came back to the hotel and Stephanie gave Makenzie a massage and worked with her for 2 hours! Thanks Steph! Makenzie was amazing! She was putting her arm above her head. She was showing us where he eyes and mouth were on command, she arched her hips, and mover her arms and legs with her head up in all fours!! WOW!!! We are in the wait and see phase of this treatment. I am trying really hard not to read into every breath see takes but most of the things listed above she has never done! I packed up a bit while Makenzie was playing with Steph and then off to bed Makenzie went! We had lots of good byes to say that night! I was so sad! We met so many wonderful people! I have a e mail list so hopefully we will be able to stay in touch!!! I feel so blessed by the whole experience! I truly feel as though God opened this door and with the help of all of you we were able to walk through it! Once again.. THANK YOU!!! We then made our trip home! We were up and ready and in the van by 6:30am and arrived at our front porch at 7:30pm last night! LONG! We just made out connecting flight after customs and immigration. Makenzie got a bath and went right to bed!!! She slept great!! I took one look at my computer and shut it... made formula and also went to bed!! Sorry! I feel rested and hungry! LOL!! We haven't been home for 2 weeks so the fridge is empty!!! After Makenzie goes to bed I will have to get on that! Makenzie's PT stopped by for a few minutes this afternoon to see how we were. She put Makenize on her lap and was amazed at how good she felt! She said that she is much more balanced and holding her trunk really well!! She has been flexing a lot less as well! Once again I am trying not to think about it... it is impossible!! They say you can see immediate results but most common is 3-6 months so now...we wait!!! Keep praying for the cells to work! Pray that God would bless Makenzie with growth and finish what man can not!!! ALL OF THE GLORY TO GOD! Thanks for everything!!! I also posted more pictures on dropshots. (photo link above) Check them out!